FLOUR ON HIS HANDS Lloyd Herrera guides freshly made linguine through a state-of-the art imported Italian pasta machine at Etto in Paso Robles' Tin City. Watching long streams of freshly made linguine pump out of a commercial Italian pasta machine is more than enchanting. It's totally satisfying. The ribbons are No. 2 pencil yellow, emerging from small bronze slots in the circular metal tube, the nose of the machine. Pasta maker Lloyd Herrera guides the soft streams toward a wooden table covered in a thin film of superfine flour. 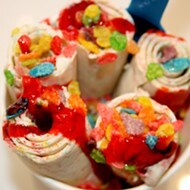 He's done this before; and he's more than able to take on an interview while he guides, wraps, and slices each batch. "Two ingredients," he says, noticing my slack-jawed awe. "It's just purified water and flour; you add the salt when you cook the pasta at home." While some pasta is bound for the nearby commercial pasta dryer—where the product slowly air dries on racks—these fresh morsels are bound for the pasta factory's popular grab-and-go deli. 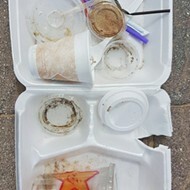 He slaps an "Etto" sticker to the top of each plastic box of artfully wrapped linguini. Herrera has been a friend of Etto Owner Brian Terrizzi for some time now, and they often found themselves drinking wine on double dates with their wives. At some point, Terrizzi would bring up "the big pasta dream." "So many people talk about amazing concepts like this, and he'd talk for years about it. I was like, 'Yeah right,'" Herrera says. "Now, look at me. Here we are. I have my dream job." It wasn't that Herrera didn't believe in his friend's dream; it just seemed like a new wild thing for Paso Robles and a hard sell. Besides, Terrizzi already had a busy boutique winery to look after, Giornata. Well, as Terrizzi says, "When I get excited about an idea, I just go." Just take his love for Italian wine. 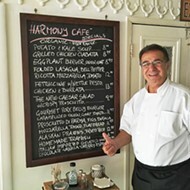 That passion began many years ago and stems from his lifelong love of Italian food and fascination with his Sicilian heritage. "I'll punch down over at the winery then run over here and check on the pasta," he says, and I can see how the long hours pile up quick, especially around harvest. "Right now I'm really focused on Etto. It's invigorating." It helps that both Terrizzi's loves—his winery and, now, his pasta shop—are located in Paso Robles' Tin City. After working for respected zinfandel producer Rosenblum Cellars, the winemaker traveled to Italy to work with the famous Paolo DeMarchi at Isole e Olena in Tuscany. Brian's experience at the Tuscany winery provided him insight into Italian winemaking, in addition to a month traveling and visiting other cellars from Tuscany to Sicily. When it came to pasta, Terrizzi did basically the same thing. He grabbed his passport and dove in head first, banging on doors and rubbing elbows with the locals. 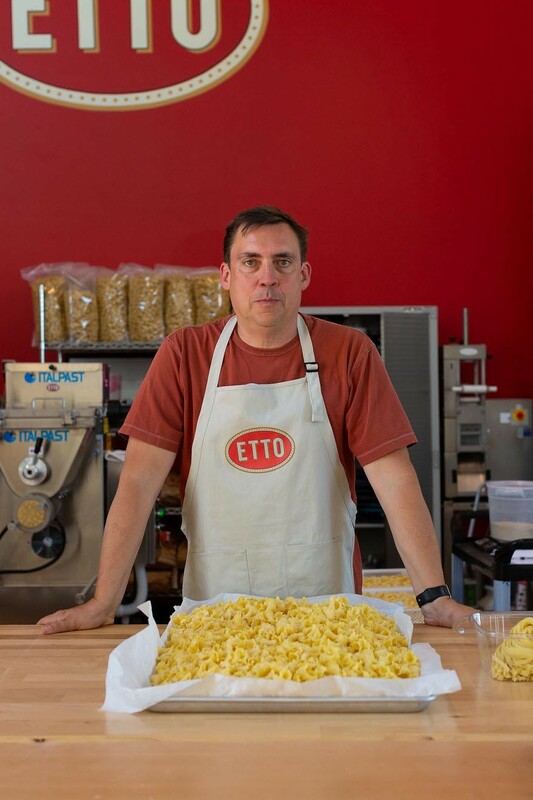 STRAIN AND SAVOR Tin City's own pasta factory, Etto, opened about six months ago with the humble dream of bringing simple, fresh, Italian-style pasta to Paso Robles. Since then, the operation has grown and sells handmade pasta to local restaurants and handing off bags of the fresh stuff to locals, tourists, and wine tasters alike. "Here in the U.S., pasta-making seemed like a secret; no one wanted to show me anything. In the wine business, everyone shows everybody everything," Terrizzi says. "So, I went to Italy last year. Everyone welcomed me in, and I learned a ton." Tours of small towns and time-tested pasta factories yielded a wealth of knowledge. Sure, he used to help his grandma make pasta when he was young, but he needed a little more know-how to create a true business. When Terrizzi returned to Paso Robles—and a small restaurant space opened in Tin City—it just seemed like the right time for "the pasta dream" to get boiling. That unrelated restaurant owned by Ash Management, home to a double Naples style wood-fired pizza oven, will host a soft opening very shortly. 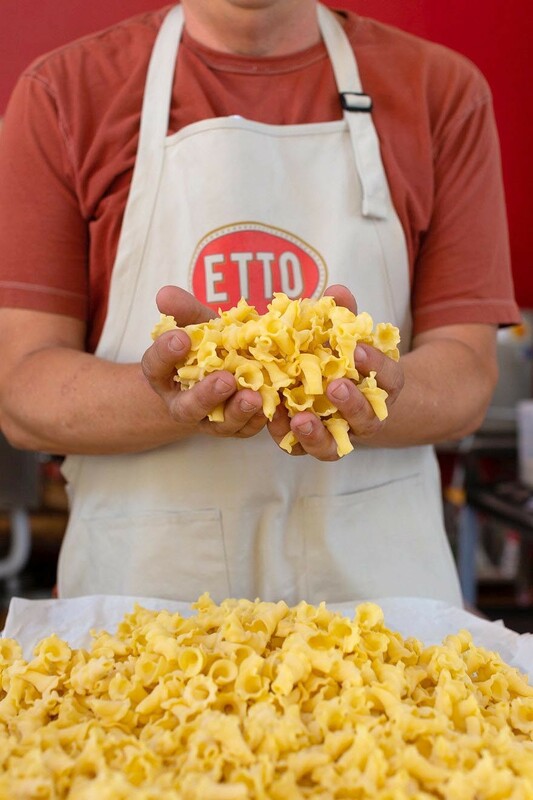 With a window connecting the restaurant space with Etto's small workshop, it will be easier than ever to toss a few loads of pasta into the chef's hands. Plus, foot traffic will probably increase. This is all starting to sound a bit like Italy, eh? 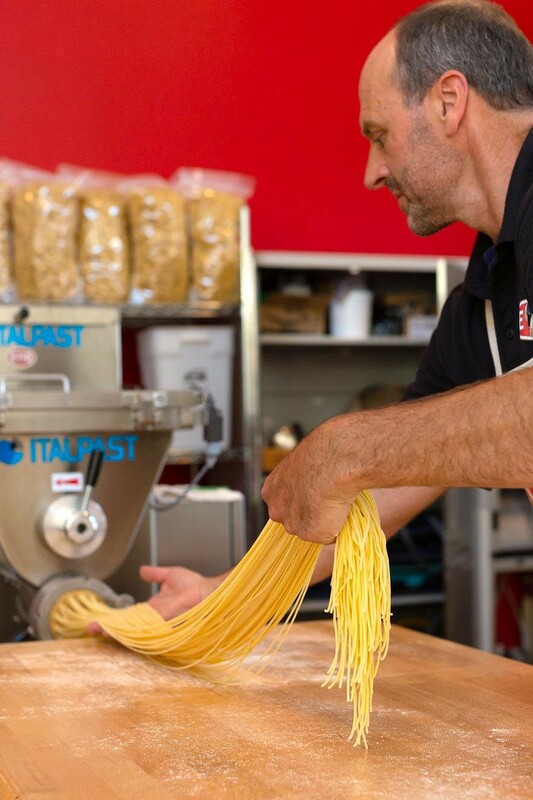 In Paso Robles—and across the county—this kind of Italian-made pasta is a cherished treat. Made with organic, freshly milled West Coast durum semolina flour from Central Milling Company, it's higher in protein and lower on the glycemic scale. 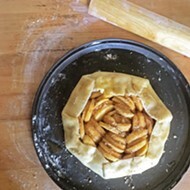 Plus, and I can speak from experience, its taste and texture runs circles around whatever store-bought stuff you've got hiding in your pantry. "We can even customize our own designs for the pasta," Terrizzi says, showing me the traditional Italian bronze dyes used to shape the different offerings. "We'd like to make a dog-shaped pasta for Woods Humane Society, and we do a special pasta for Must! Charity." Once a month, folks line up around the block to take home delicate freshly made ramen noodles (your next opportunity to get in on this is Nov. 1). Your order comes with special ramen soup spoons and chopsticks, Japanese candy, plus you can pick up a box of broth right there in shop. It's no wonder Etto's range of dried pastas have been swooped up by local restaurants like Novo and The Range. Cal Poly has just put in an order, too. HOLY MACARONI Etto owner Brian Terrizzi is splitting his focus between an old and new love: The first, his winery, Giornata, and second, his pasta factory, Etto, which opened about six months ago in Tin City. Both are inspired by Italian artistry and both work quite well when paired together. The fresh pasta, including a charcoal-black, slightly briny squid ink spaghetti neri, is available in the refrigerated case alongside fresh pastas of the day (this might be macaroni, trombe, reginetta Napoletane, zitti, gemelli ... you get the idea). Ravioli stuffed with locally raised lamb and other savory fillings can be found in the freezer case. You'll also find Atascadero-made Alle-Pia salumi, local honey, olive oil, and imported Italian staples like canned tomatoes and "chocolate salami," which should be on everyone's holiday gift list. 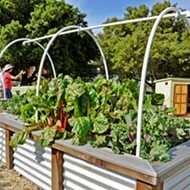 Nearby, a small table filled with Windrose Farm produce rounds out your dinner plans. In essence, Etto is exactly the kind of shop you'd find in Naples or Parma. Everything is local, everything is delicious, and you can totally have a conversation with the pasta maker while he's doing his thing. "Kids come in and they are just fascinated, and we always take them back to see the pasta being made," Terrizzi says. 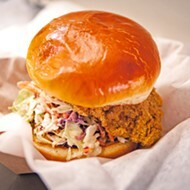 "We all want to know where our food comes from, and that it's clean and made with care. There are so many parallels to Italy and Paso Robles­—the climate, the wine, the food." The winemaker points out the glass door at the golden hills, illuminated by the late morning light. "I mean, just look outside and over the horizon. We could be somewhere in Italy right now." Hayley Thomas Cain loves the squid ink pasta with salmon and a squeeze of lemon. She can be reached at hthomas@newtimesslo.com.